Got a blog to recommend, from a fellow named Jake, who's working his way around the circuit in Cambodia right now. His blog is called My Alternative Life. I've put a link in the sidebar on this page under "Worth Your While," because it is. Go spend a little time with Jake when you get a chance. Check out what's on his front page right now, for example. Shooting big, swaggery weapons, Angkor Wat and a great, fascinating and very photogenic place, Cambodia's Tonle Sap Lake. What's not to like? There’s not a hell of a lot to say about Phnom Penh, really. You’ve seen one hardscrabble, impoverished, backward, big, poor, provincial city in Southeast Asia, you’ve seen Phnom Penh – except this one is a national capital. Phnom Penh is the place on the globe most exactly opposite in every way to Vienna. It’s haphazard as Vientiane, the capital of Laos, but it’s ten times the size. It has a sort of genial, low-rise sprawl that wanders on into the outskirts until you find yourself in uninterested rabble and uninspired local markets with livestock in between. We hired a Corolla and pointed our way down Preah Monivong onto Mao Tse Tung Street. The official street signs look official, but behind them on the sides of buildings you get an occasional peek at the French colonial “Rue Mao Tse Tung” versions, in peeling paint. Mao Street itself, as we swung right onto it, greeted us as a warehouse district stocking steel bars, tubes, channels and shapes, and then PVC pipe and tubing. It stretched several kilometers this way, away from the river, and while most businesses were open air, there were occasional enclosed A/C restaurants, the odd “hand phone” shop, and a bright new sleek Intercontinental Hotel. I pondered the Suki Soup Wedding Hall. The drive was more of an amble, even when the road was flat, maybe thirty-five kilometers an hour, because of the crush of scooters and the vague driving rules. The Cambodian left turn across traffic is really a gentle, gradual veer that can take up hundreds of feet and introduces oncoming traffic directly into your lane at any given moment. The third road off Mao Street wasn’t really tarmac, and with rainwater filling the pot holes, it’s a marvel how the scooter riders’ clothes stayed spotless. It took almost an hour to get out the fifteen kilometers to Cheong Ek, and the same to get back. 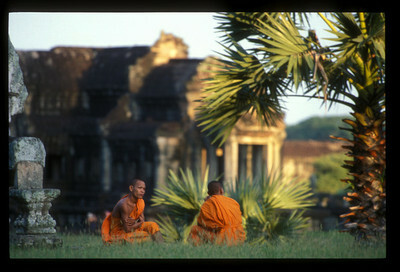 - From the archives, impressions of a previous trip to Cambodia. Click the photos to make them bigger, and see more photos in the Cambodia Gallery at EarthPhotos.com. As we continue proofreading and polishing up the eventual book Common Sense and Whiskey, we're posting the chapters here. Previous entries: Greenland, Sri Lanka, Tasmania, Paraguay and Climbing Mt. Kinabalu. Today we're in Phnom Penh, Cambodia. There’s not much to say about Phnom Penh, really. You’ve seen one hardscrabble, impoverished, backward,big, poor, provincial city in Southeast Asia, you’ve seen Phnom Penh. Except this one is a national capital. Mao Street itself, as we swung right onto it, greeted us as a warehouse district stocking steel bars, tubes, channels and shapes, and then PVC pipe and tubing. It stretched several kilometers this way, away from the river, and while most businesses were open air, there were occasional enclosed A/C restaurants, the odd “hand phone” shop, and a bright new sleek Intercontinental Hotel. We pondered the Suki Soup Wedding Hall. The drive was more of an amble even when the road was flat, never more than about thirty-five kilometers an hour because of the crush of scooters and the vague driving rules. The Cambodian left turn across traffic is really a gentle, gradual veer into oncoming traffic. It can take up hundreds of feet, forcing oncoming traffic directly into the lane of the vehicle behind you. The third road off Mao Street didn’t really qualify as tarmac, exactly, and with rainwater filling the pot holes, it’s a marvel how the scooter riders’ clothes stayed spotless. I’m a little disturbed how under-disturbed I was by the Cheong Ek Genocidal Center. Cheong Ek is the site where some 17,000 civilians were massacred and buried by the Khmers. The monument is a simple place with a glass stupa filled with 8,000 exhumed skulls in sections labeled “elderly woman” and “young man” and so on, and clothing in the bottom. It took almost an hour to get out the fifteen kilometers to the Cheong Ek Genocidal Center, and the same to get back. And there were deep-fried tarantulas on offer, too. The culinary wilds of exotic Southeast Asia? No, er, um, Fortnum & Mason, London, actually. We passed on the tarantulas, but Leo Laksi, who's been on a swing through Laos and Cambodia, tried them. Where DID I put my 727? Cambodia might be the first country to lose an airplane. Gadling tells the tale of an Air Dream Boeing 727 with a Cambodian flag - abandoned at Noi Bai airport Hanoi. We don't think there's a hell of a lot to say about the capital, Phnom Penh, really. You’ve seen one hardscrabble, impoverished, backward, big, poor, provincial city in Southeast Asia, you’ve seen Phnom Penh – except this one is a national capital.